This is the perfect solar telescope package to travel with. Why not take a solar telescope with you on your next trip? A solar telescope will provide countless hours of enjoyment for you and your family. The ever changing surface of the Sun is one of the wonders of the universe. The most amazing thing is that even an amateur can study and enjoy it. This Solar Telescope Travel Package has everything you will need to start viewing the Sun. What’s even better is that you can take it with you when you travel. The weight of the scope is under 20 pounds and it is compact enough to carry on a plane. Not only will you get spectacular view of the Sun but the package is designed for imaging with your camera (not included). Don’t miss out. Take one on your next trip. First, the solar telescope travel package contains our LS60 optical telescope assemble. Notably this scope has our pressure tuning system that will give you great clear view of the Sun. Our pressure tuning technology will give you an evenly lit surface view of the Sun. Next, we have included our B1200 blocking filter. Additionally, this gives you the flexibility to use your camera to photograph what you will be seeing. 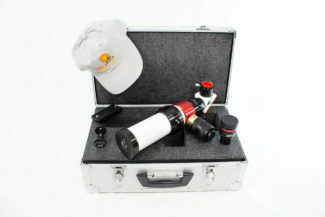 Also, your solar telescope travel package comes with a zoom eyepiece. This will give you the ultimate in flexibility as you look at all or part of the disk of the Sun. We have included our 1.5″ feather touch focuser which will give you the smoothest focusing mechanism available. This will make it easy to focus in on very fine details. The Omni CG-4 Manual Telescope Mount includes RA and DEC manual slow motion controls. Moreover, it is mounted on a tripod with an adjustable height steel leg tripod with center brace accessory tray. Additionally, the mount comes with two counterweights. One counterweight is 7 lbs and the other is 4 lbs. Next, we have included our 6 inch dovetail mount to securely attach the telescope on the Omni CG-4 (included). This tripod and mounting system will give you a good solid foundation for your solar telescope. To finish the solar viewing starter package we have included a tele vue sol-searcher. This will make it easy to locate the Sun safely. Your solar telescope comes with an aluminium case to protect your investment from being damaged as you travel. The components of your telescope fit in to a foam cut out to prevent movement inside the case. As an extra, we have added a Lunt Solar Systems hat to protect you when you are out in the Sun. This package includes everything you will need to start viewing the Sun immediately. Take it with you when you travel to view the sun. It will be an unforgettable experience.